ideal for lab and production work. Self-contained licence allows you to run XJTAG from a standalone PXI rack. Re-configurable unit for multiple UUTs saving costs. Easy integration with NI's LabVIEW*. Can supply power to the target board through the JTAG connector (3.3V, <100mA). — e.g. hold a board in reset / turn on a PSU. Simple DLL API interface: includes commands such as tmsReset() irScan() drScan() etc. Full tutorials provided for all software packages based on supplied demonstration hardware. 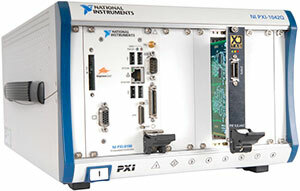 PXI XJLink2 provides a JTAG solution that can be integrated with other test equipment using the industrial PXI standard designed to minimise the effect of electrical noise. CompactPCI® compatible so it can be used in any cPCI or PXI-based test system. Only one simple cable assembly is required to connect to your target board — no extra adapters needed. The 20-way connector is configurable to match the connector pinout on the PCB. The ability to change the pinmap for the JTAG signals simplifies the process of connecting your XJTAG test system to the Unit Under Test. The standard .NET and COM interfaces allow you to integrate XJTAG testing with test executives such as NI LabVIEWTM, LabWindowsTM/CVI, with ATE machines, or a bespoke application written in languages such as Visual Basic .NET® or C#®. XJTAG provides coding examples for LabVIEW, LabWindows, C#, C++ and Visual Basic. *The XJTAG trademark and logo are registered trademarks of XJTAG Ltd. All Rights Reserved. CompactPCI® is a registered trademark of the PCI Industrial Computers Manufacturers Group. LabVIEW and LabWindows are registered trademarks of National Instruments. All other trademarks are the property of their respective owners. From a single port system for development to multiport test and programming systems in production, the PXI XJLink2 module provides a flexible, scalable JTAG solution. With self-contained licences, all XJTAG hardware provides flexibility as no network connection is required for the test system to run. PXI XJLink2 has variable signal termination, so it can handle boards both with and without signal termination. The advanced auto-skew control enables you to get the maximum frequency out of your JTAG chain and cable.